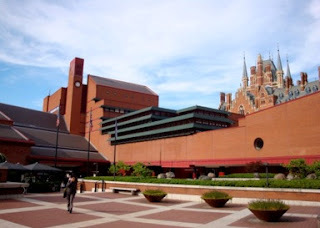 When I’m in London I spend a lot of my time in the hushed yet humming, hive-like halls of the British Library. I’ve had a Readers Pass almost 20 years now. 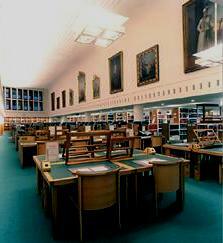 I first began using the BL’s Reading Rooms at Bloomsbury before the Library moved to St Pancras in the late 1990s. 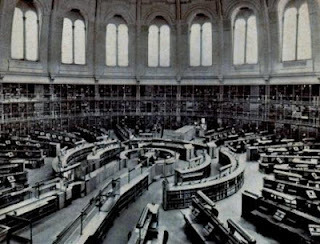 In those days, when the BL still preserved its lingering air of Victorian decay, Readers used to request books by filling out a little chit of carbon-triplicate paper, which would then require posting through a little wooden window in the centre of the Round Reading Room. The first time I ever did this, I hesitated a moment, hoping I’d filled in my request slip correctly, but before I could reconsider a disembodied hand shot out of the little hole and snatched it from my startled grasp. 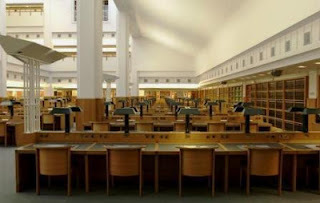 The slip was then placed into a small cylindrical capsule and promptly whisked off around a pneumatic tube transport system into the unfathomable depths of the old library (the tubes used to whisper quietly like ghosts). Eventually your book would arrive at your desk, delivered by the stately progress of a rickety old trolley, with one of those carbons tucked between the leaves. Nowadays, in essence, the same system operates at the “new” St. Pancras site – except you now log on, look up, and then click on the correct button on a computer screen and the whirling mechanism of the Library is set in motion. Eventually a little green light pops on at your desk to tell you that your book has been retrieved and awaits collection from the issue desk. No longer the luxury of being waited upon, instead you now have to trudge to pick it up yourself. Yet at St. Pancras the Library has experienced a new lease of life. It seems to have expanded into its own rightful, distinct entity. Having been born as part of the British Museum in the original Hellenistic concept of the Mouseion, it eventually out-grew its cramped space just as the Natural History collections had before it, and so of necessity each moved out to set up in their own premises. 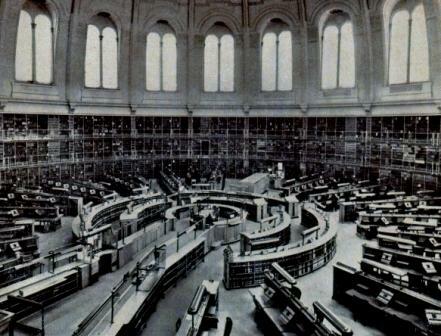 In the early days there was a forlorn and gloomy quiet atmosphere to the “new” BL, rather like shell-shock it seemed. Readers and staff alike seemed discombobulated by the shock of the new. The place felt too spick and freshly oiled. Like putting on a new pair of shoes which pinched and didn’t feel comfortable, it took time to wear them in. But now the BL seems content in who and what it is. Happily it didn’t shrug off altogether all that old, richly patinated history which it had accrued over the centuries at Bloomsbury, instead it bravely spearheaded new life into the forbidding hinterlands of Kings Cross. It fostered for itself a comfortable niche on the other side of the University of London, sitting at the top of ‘the cultural mile’ which stretches down to the southbank of the Thames. From the outside it is an odd looking edifice. Rather like a ship berthed alongside the Gothic fantasy of the St Pancras railway terminus and old hotel next door. Built of the same red brick and cream-coloured stone, its appearance – rather like a strangely sunken Lego construction – belies the beauty to be found within. Inside it is a light, cavernous, and enticingly open labyrinth. The warmth of oak, brass, and leather is a wonderful updating of the Victorian space it used to occupy down the road. Over ten years on, the fixtures and fittings are now beginning to mellow pleasantly into their daily use. The initially Spartan outer spaces have begun to be colonised by comfy chairs where a diverse range of students, scholars, artists and entrepreneurs have encamped and plugged themselves into the unfathomable outer realms of the digital entelechy – wearing headphones, staring at laptops, ipads, mobile phones, etc., scribbling biro nibs across spiral-bound notebooks, highlighting sentences in dog-eared textbooks, pencilling in the margins, with the smell of freshly ground coffee pervading pleasantly all around. 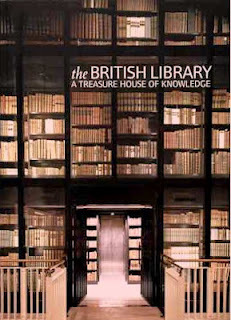 The new world of the BL now seems complete, but it took decades to reach its present form. Growing up in the 1980s I regularly used to be whisked along the Euston Road and I can recall watching from the car’s window the place slowly evolving out of an enormous hole that was dug where a vast railway yard used to be. 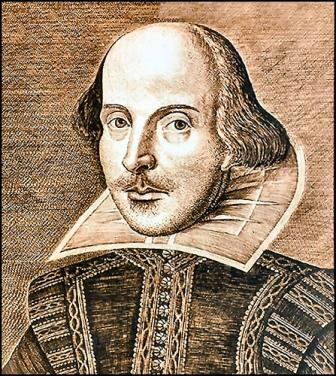 For years the familiar face of William Shakespeare used to look down from the hoardings around the site with that knowing smile which seemed to hint that he knew of the wonder-house of wisdom which was yet to come. The notion that every book ever printed (well, almost every book) would fill up that enormous hole used to frazzle my mind, and even then I knew that this was something I would want to see and get to know once it finally arrived. Imagine having access to all that knowledge! … And it is a genuine privilege. Freely available to everyone – the world’s knowledge under one roof. The ancient encyclopaedic ambition of the Ptolemies perpetuated into the modern world. The very essence of the BL has been bottled by Robin Hunt and was broadcast today on BBC Radio, where it will be available for the next seven days. 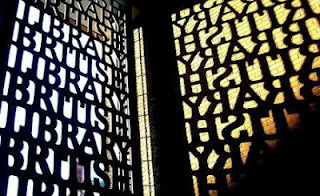 And in case you are wondering I’m one of the ‘nomads’ he describes, most often found either in the far flung corner of Humanities 1 or the far end of Asian and African Studies, and – hopefully – I haven’t dozed off … it has been known to happen!